Is this in addition to that tiny and I mean TINY little north pointer at the lower left of the nav screen? See post #48, this thread. I got into the settings menu and go to 7-7 but there is no 7.10 it only goes to 7.8. I have an 08 C350. I purchased it early in 08. What do I ask the service guys at the dealership? The heading should indicate 1/2 on top of the first screen. Scroll down to the 7-7 entry and click the COMAND control dial one click "down" and it should open up page 2. Very cool feature, it is kinda interesting to look at. What version of Command do you have? Same here with the updated Comand software. But, if this mysterious compass does not appear on the Nav screen, what's the point? If you turn it back on and select the COMPASS Option, it will change the screen and you will see what everyone is talking about. To find the COMPASS Option, take a look at the first post in this discussion thread, which has pics, then go into the NAV options on Destination or Position (I am not in front of it so I kinda don't remember the name), and you should see COMPASS at the bottom of the options. Select that and you should see it. 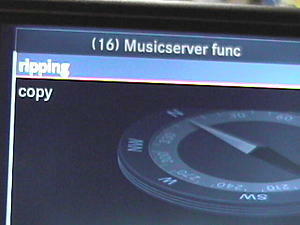 OBTW, on my updated Comand Software, the MusicServer Ripping and Copy options are gone! Here are before and after shots. Last edited by Nuru; 05-02-2009 at 02:04 PM. Mine still shows rip or copy, your last picture if you page down you should see rip or copy. I put up the wrong picture actually, take a look at the 3rd pic now. 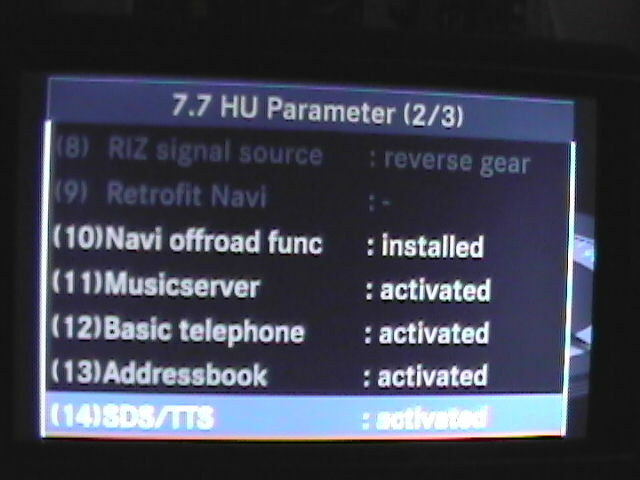 And I have added the screen 2 pic also. Your apparently lucky if you updated and it still shows both ripping and Copy. I thought i would at least keep ripping? Last edited by Nuru; 05-02-2009 at 02:11 PM. What are these features used for?, "copy" and "ripping" ? Copying is copying CD/DVD to a CD or DVD. Apparently so, but remember the Engineering Menu is not for Consumer usage officially. 1. Ripping is making mp3's from audio disks and copying them to hard disk. 2. 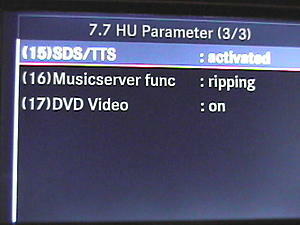 Copying is about direct copying of mp3's from other media (mp3 CD, memory stick, CF card) to hard disk. So this feature isnt activated by default? 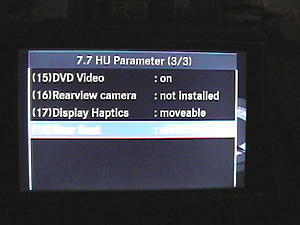 And will these settings dissapear with the latest HU software? 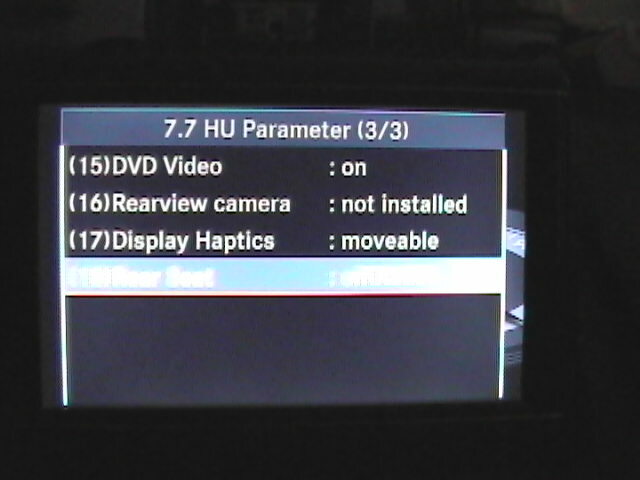 When the Comand HU software is updated to a newer version, apparently they took that feature out. The earlier version of my Comand's software had that feature. Hmm, so one local tech is not telling the truth when he said he could copy CDs and DVDs and that he burned them too - i was suspicious about whether or not the Comand could do that. That is why in my response, I indicated generally what it meant. Vic, i sent you a direct email - take a look. Does the compass work for the c63 too? I was checking the new BMW 7 series at my dealer (Herb Chambers own both Mercedes and BMW dealers, among many otheres) and it has this feature of the side cameras. The cameras are located on the fron fenders in front of the wheels. The screen is split vertically and each side shows that camera. I guess this is only usefull when going out of tight spaces to make sure no pedestrian or car is comming. I would say this is more a show-off feature than it is practical. I wonder why that option is even there on our COMAND. As someone said, maybe it is the same software they use in other higher end models. Do you mean Herb Chambers as in Foreign Motors West of Natick? For what it's worth, if you have the APS 50 (Audio 20 with a limited GPS added on, not available in US), then the standard view when selecting the navigation function is a compass much like the one shown in this thread. Doesn't have the altimeter though. What exactly do you see when you select navigation on a COMAND without entering a destination? yeah i need the update damit. Last edited by CrAZyVeGAsBoY; 06-04-2009 at 09:22 PM. Can I also have this compass feature on audio 20 with UMI installed? Mine sometimes says 12 satellites but still i have never noticed a reading on the altitude meter. Its always 0. I should be below sea level . Amsterdam here . I get the readings in Meters. and it always says 0 meters even if i go uphill like a bridge or something or a small fly over.